August 22, 2017 August 22, 2017 - by Euan - 2 Comments. The reason for the increase was due to the South-Korean exchange Bithumb – the world’s most used cryptocurrency exchange – announcing that it is to start supporting Monero deposits from August 23rd with trading beginning on August 27th. Anyone that deposits during the deposit period will receive a 1% premium, and the top 50 biggest traders (in volume) from midnight on August 26th through to August 27th will receive 100 XMR. 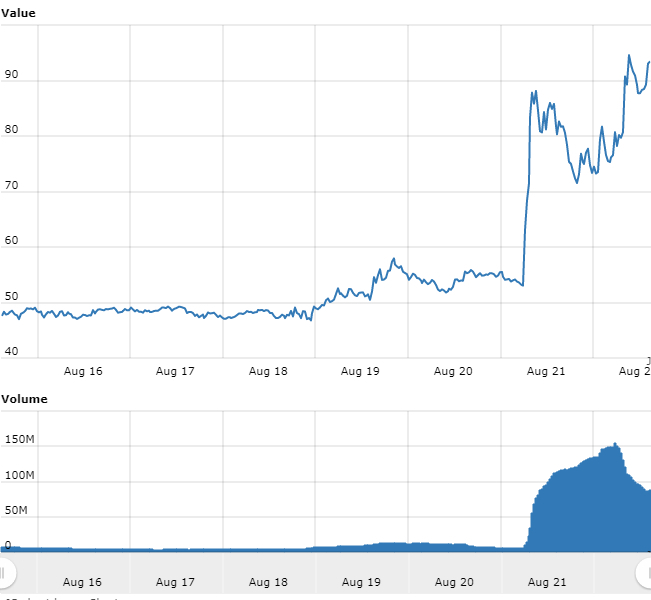 Monero’s price has increased over 50% in the past 24 hours! The listing of Monero is very good news for the currency that has seen little traction for a while. Unlike Bitcoin, Monero transactions and wallet balances can be totally anonymous which makes it very difficult to trace movement of money. Also there is no developer fee and it has an adaptive block size, which means there will be no transaction size issues similar to those that caused the recent Bitcoin Fork. You never know how high it might reach! Do you own any Monero? or Do you plan to purchase some now? Let us know in the comments below! Previous Article RX Vega is here! – What does this mean for mining?